Like the Genovese and the Gambino, the Orchidaceae are an intimidating family. With about 25,000 species, it's also the largest family of flowering plants. This does not make it any easier to identify a member, however. So let me ask you: how do you know when a flower is an orchid? Most people will probably answer, 'you can tell by the differently coloured lip'. This would be a mistake. Many plants with brightly coloured lips aren't orchids at all. Many others just have a gestalt that screams 'orchid' in hot pink tones, but you'd be wrong again. Botany is sometimes confusing. Let's take a look at a few examples of flowers that seem to mimic those of the orchids. 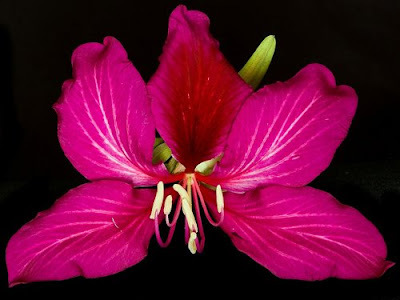 Bauhinia blakeana [Fabaceae - the Legume family]. It's easy to see why this is called the Hong Kong orchid tree, for the resemblance to an orchid blossom is rather striking. In 1880, Sir Henry Blake - then British Governor of Hong Kong and a keen botanist - discovered the plant growing near the ruins of a building on the shore of Pok Fu Lam. It has since become the floral emblem of Hong Kong. A popular tree for highway medians and parking lots in hot cities, it's large heart-shaped leaves make it attractive even when out-of-bloom. Alpinia zerumbet [Zingiberaceae - the Ginger family]. Many members of this gorgeous plant family produce flowers that appear orchid-like, complete with glowing lips in the correct, lowermost orientation. 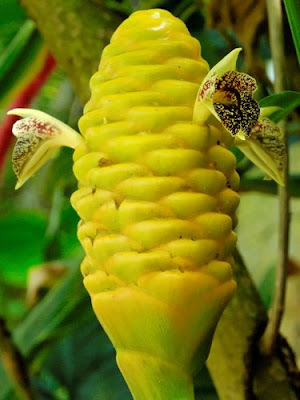 Unlike orchid flowers, those of ginger do not possess a column, the central structure formed from the fusion of male and female parts. Shell ginger is a good example. This Chinese evergreen rapidly forms large clumps of lush tropical foliage when grown in frost-free areas with partial shade. 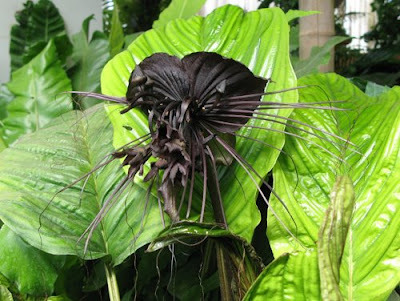 Tacca chantrieri [Dioscoreaceae - the Yam family]. After seeing the diverse array of black orchids out there, it is tempting to classify this sinister thing as an orchid. The bat flower, as it is affectionately known, actually belongs to the plant family that includes yams and other herbaceous vines. What appears to be large, darkly coloured petals are in fact involucral bracts, and not floral structures at all, just like the festive red 'petals' of the poinsettia. The real flowers are the cup-shaped structures within, surrounded by distinctive whiskers. If you can grow Phalaenopsis orchids really well, this Malaysian terrestrial should be well-suited to your conditions: it likes shade, high humidity and good air circulation. Zingiber spectabile [Zingiberaceae - the Ginger family]. Another ginger species, the beehive ginger should not be confused with the related Z. officinale, the beloved culinary ginger. The plants grow quite tall, with the inflorescences typically carried beneath the attractive foliage. The beehive structure of the flowerhead is - once again - formed from colourful bracts, with the orchid-like flowers themselves appearing from between these. Gardeners and florists have many varieties to choose from, with flowerheads in orange, pink, yellow, red and several bicoloured combinations. Strongylodon macrobotrys [Fabaceae - the Legume family]. 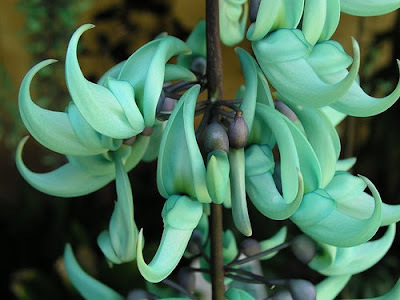 The jade vine produces pendant clusters of totally unique aquamarine flowers. Once you've walked under a pergola festooned with these, the watery blooms of a wisteria seem positively wistful by comparison. It's not only the Orchidaceae that produce flowers of unusual colour, it seems. The jade vine hails from the Philippines, that trove of botanical marvels, where its blooms are visited by rainforest bats. It was first collected in 1854 on Mount Makiling on the island of Luzon by botanists of the U.S. Wilkes Exploring Expedition. Perhaps not surprisingly, it is now exceedingly rare in the wild and faces threat from deforestation. Catalpa speciosa [Bignoniaceae - the Jacaranda family]. Just as orchids are not confined to the tropics, so orchid mimics can be found in virtually every environment. 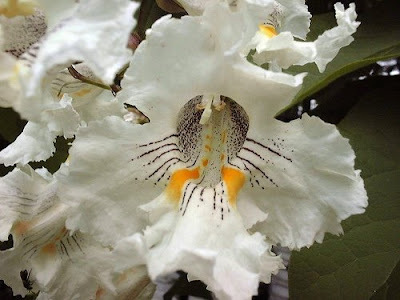 The Northern catalpa is a deciduous ornamental tree from the United States, orginally found along the Mississippi River basin, but now naturalized throughout much of the Midwest and considered invasive in places. It is known by several names in the vernacular, cigar tree and Indian bean being the most common, refering to the long, slender pods formed in mid-summer after flowering. The showy flowers bring to mind those of a unifoliate Cattleya, being large, white, ruffled and with distinct streaks of colour toward the interior. 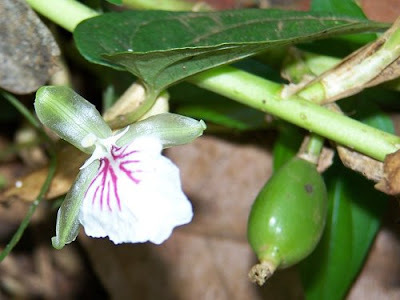 Elettaria cardamomum [Zingiberaceae - the Ginger family]. Cardamom is a giant among gingers, growing to a height of almost 4 m. By contrast, the inflorescences are minute and held close to the ground, bearing several small blossoms. It grows wild in moist forests of the Western Ghats on India's Malabar Coast. An expensive spice, cardamom needs to be hand-picked daily at the moment of perfect ripeness. Few gourmands realize that the cardamom they praise so highly for the beauty of its aromatic fragrance has equally beautiful flowers. These blossoms are truly deserving of the moniker 'orchid-like'. 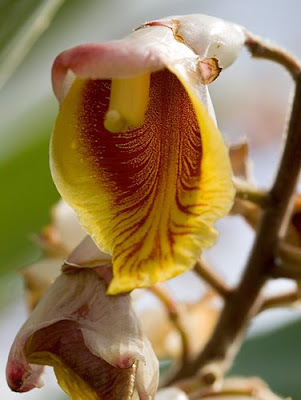 Photography credits: Bauhinia blakeana © Christoph Diewald; Alpinia zerumbet © Avelino Maestas; Tacca chantrieri © Julia; Zingiber spectabile © Tony; Strongylodon macrobotrys © David Midgley; Catalpa speciosa © Cindy Ware; Elettaria cardamomum © Gopu P. Please visit these exceptional Flickr users for more floral excellence. "At 2 a.m., saw land ahead, luffed and cleared it. It appeared an island 5 or 6 miles in length, running N.E. and S.W., with a high round bluff on the N.E. end, with low land to S.W. : between N.E. and S.W. ends there appeared a valley covered with ice and snow; we passed it within a quarter of a mile, going ten knots: lat. 39° 20' S., long. 120° 20' W.: the position for lat. and long. may differ a few miles by reason of not having had proper observations for several preceding and following days." On 29th of May, 1841, Captain Dougherty of the British whaler James Stewart reported passing within six hundred yards of a six mile-long island in the Great Southern Ocean. On the northeastern end was a high bluff, while the southwestern end was lower and tapered to a point. The captain said that he could see a deep valley with vegetation and some snow. Although none of the navigators saw any signs of human habitation, there were many birds and evidence of animal life. The place was named Dougherty Island, after its discoverer, and received a mention in Findlay's 'A directory for the navigation of the Pacific ocean', published in 1851 by Oxford University Press. On 4th of September, 1859, Dougherty was sighted by the Louise, a ship from Bristol. The captain of the Louise noted the island to be dark in colour; he estimated that it rose only eighty feet above the surface of the water. The coordinates given by the captain were 59° 21' S., 119° 7' W. In 1886 came another report of Dougherty, this time from the barque Cingalese. Her captain affirmed that the island was six miles long, and that the northeastern part was high while the southwestern point was low. However, he described the island as barren, with no vegetation of any kind. Try to look for Dougherty Island on any modern map. Use Google Earth and the documented coordinates. You won't find it. And that's because Dougherty doesn't exist: it's a phantom island. 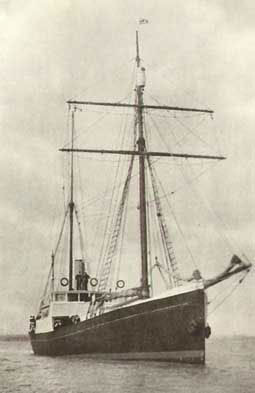 The fateful 1921-1922 Shackleton–Rowett Expedition - the one that would claim Ernest Shackleton's life - was the last voyage in search of it and several other doubtful isles of the southern hemisphere. The Scott Polar Research Institute lists 15 of these in the Antarctic Ocean alone: The Aurora Islands, Burdwood's Island, The Chimneys, Dougherty's Island, Elizabethides, Emerald Island, Isla Grande, Macey's Island, New South Greenland, Nimrod Island, Pagoda Rock, Royal Company Island, Swain's Island, Thompson Island, and Trulsklippen. All discovered and charted, only to quietly slip off our maps once they proved to be non-existent. The Aurora Islands continued to appear on maps of the South Atlantic until the 1870s, even though their last sighting was in 1856. First spotted by the Aurora of Spain in 1762, this group of three islands was supposedly located east of Cape Horn, halfway between the Falklands and South Georgia. Some experts claim that the Aurora Islands are merely the Shag Rocks, six small islets 150 miles west of South Georgia. Curiously, the Shag Rocks are known as the Islas Aurora in Spanish to this day. Phantom Islands are no longer reported. We have grown sophisticated, and make fewer navigational errors. We have grown knowledgeable, and can identify icebergs, fog banks, or oceanic and atmospheric optical illusions for what they are. We now have the power to see the whole surface of the Globe from space, to penetrate its waters with imaging equipment and scope out the topography of mountains under the oceans. But the world does not give up its secrets that easily. There are many places still hidden from view, many secrets not yet revealed. Glowing lights in the dark depths of the ocean, the catacombs of forgotten cities, the airless tropical swamps protected by leeches and disease, the mute progression of evolution captured in the DNA of every creature known and unknown, abandoned treasure on the high wastelands of the Earth: in 100 posts, (E&E)² has attempted to share some of these things with you, dear reader. As we deftly set sail for the terra incognita of our next 100 topics, my hope is that the wonder of the unknown will inspire and excite you as much as it has thrilled and stimulated me. 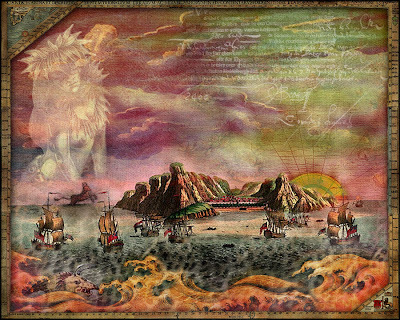 Picture credit: a big thank you to Dalyn for her visionary artwork combining elements of several famous maps. Can you spot them all?